Salt and Sanctuary for the Nintendo Switch hits the hybrid console two years after its PS4, PS Vita, and PC release. It's a 2D action platformer that borrows liberally from Dark Souls. Made by Ska Studios, who have been responsible for some Xbox 360 indie classics like Charlie Murder and The Dishwasher: Dead Samurai, Salt and Sanctuary follows the developer's edgy, violent design aesthetic and features hand-drawn characters. Like most games inspired by Dark Souls, the focus in Salt and Sanctuary is on exploration and combat instead of storytelling. Sure, there's a plot of sorts, which has you shipwrecked on an island in search of a princess, but it just serves an excuse to traipse around an island filled with sinister dungeons and cursed monuments. Where it differs from its inspiration is in traversal. There are more than a few platforming sections and your progress isn't just dependent on your combat skills but in your ability to hop across chasms. 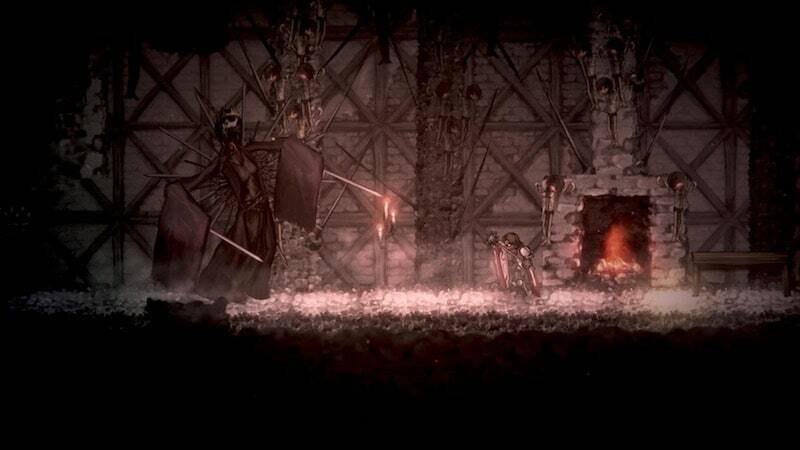 Furthermore, Salt and Sanctuary has some variance in combat, allowing you to juggle enemies in the air while slashing them to bits like in the Devil May Cry games and there are certain abilities that can let you glide through the air with ease. While these embellishments freshen things up a bit, they also layer an all too familiar fighting system. Much like Dark Souls, you'll need to anticipate when to land an attack, when to parry, and of course, when to dodge thanks to your character's complex animations that you need to wind up before striking a blow or deflecting a hit. You'll collect salt, which aids you in levelling up, and can use sanctuaries - just as you would use bonfires in Dark Souls - to upgrade your abilities. Dying has you losing all your accumulated salt and items and you can regain them once you defeat the enemy that killed you the first time around. All of this results in gameplay that's similar to Dark Souls, which isn't a bad thing at all. Apart from this, you can populate sanctuaries with merchants and blacksmiths, granting you to get better gear as you keep playing. Throw in a skill tree not too dissimilar to Final Fantasy X's sphere grid as well as a full set of elemental magic to try out as well as the ability to upgrade weapons and armour independently, and there's enough to keep you progressing through its gritty, twisted world. However, Salt and Sanctuary isn't without its failings. There's no map. Coupled with its 2D sprawling level design, it's easy to get lost. Plus, there's little information on character classes. Outside of any knowledge you might have of warriors, knights, and mages, the lack of details makes it tough for newcomers to decide what to pick. Also, in handheld mode, the game's text is a bit too small to read. This isn't a problem when playing in docked mode on a big screen though. And it doesn't help matters that the Nintendo Switch's Joy-Con buttons feel too small either, making use of a Pro Controller mandatory. As derivative as it may sound, Salt and Sanctuary is an enjoyable romp on the Nintendo Switch thanks to its entertaining combat. It's good enough to warrant checking it out despite some concerns. With Dark Souls for the Nintendo Switch missing in action, Salt and Sanctuary is an enjoyable way to get your Souls fix. Gadgets 360 played a review copy of Salt and Sanctuary for the Nintendo Switch. The game is available via Steam, PS Store, and Nintendo eShop right now at $17.99 (around Rs. 1,238). It will be available as a physical cartridge on the Nintendo Switch via Leadman Games later in the year. product Salt and Sanctuary for the Nintendo Switch hits the hybrid console two years after its PS4, PS Vita, and PC release.